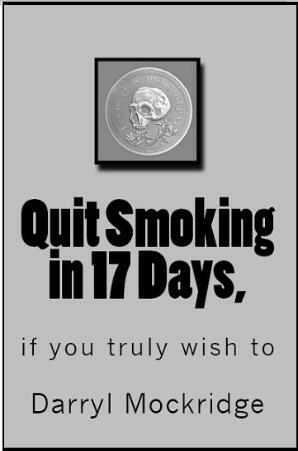 The title of this booklet is “QUIT SMOKING in 17 DAYS, if you truly wish to”. being tested. And that test begins right now. bother to go any further until you have signed that statement. everyone knows—including yourself—is not only stupid, but dangerous. If you think the longer you wait the easier it’s going to be, you’re wrong. through it myself and I know that it is not. I am telling you that you have the capability to do it. Here’s what is expected of you in the meantime. expected of you. Read and consider. 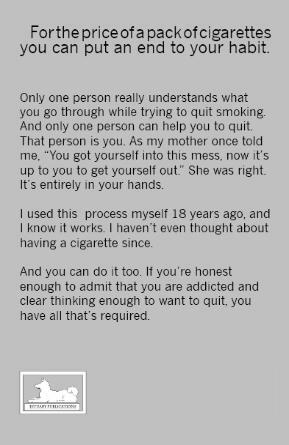 Have you honestly decided to kick this habit? scheme and scam ever invented. approach to breaking any addiction is easily defeated by excuses. you gave up your right to any and all excuses. might as well start right this minute.